I have transcribed orchestral works for the organ, as the sound of the organ is often close to that of an orchestra, and, occasionally, vice versa. When making transcriptions, I always take the original version into account but my goal is to find a suitable fresh sound for the composition concerned. I have also transcribed piano works for the organ. When doing so, I have discovered new dimensions in these piano works; that is because when transcribing a piano work for the organ, I must look at the piano work from an orchestral perspective (for instance, Bird as Prophet by Robert Schumann). I want to play contemporary as well as rarely performed music, as they often fittingly counterbalance my basic repertoire. I find that music is too often artificially divided into different categories. Some of the music even composed by grand masters is ‘not so good or interesting’, and neglected composers or composers who have been completely forgotten have created works that are definitely worth performing and listening to. Working together with composers is very important for me. It forms a significant part of my musicianship, as any composer may be interested in writing an organ work. Covering almost all aspects of life, music is an extremely complex and fascinating phenomenon. That is why I seek to keep my perspective as a musician as broad as possible. I don’t want to keep to the beaten track nor specialise in just one style or era. Sometimes I even surprise myself with this kind of unpredictability. As an organist I highly value traditions but, on the other hand, I want to create new ideas and break through artificial barriers. 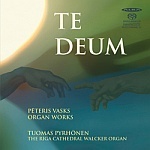 Thus, I make transcriptions for the organ, play contemporary and rarely performed music and work together with composers. However, I won’t forget my basic repertoire, as I do like it a lot. It is where I have laid the foundations of my musicianship. But, to be able to further develop my artistic imagination, I must follow the ongoing development from as many perspectives as possible. For me, music isn’t only a profession and a pastime; it is, above all, a lifestyle.